GwenGear San Francisco started with the arrival of an English bulldog named Gwen in 2006. The search began to adorn Gwen in Hip Gear that represented our urban style. The market place was chock full of cute and bling, but lacked the modern clean look we craved. So we went to work creating our own exclusive designs and individually handcrafting each piece in San Francisco, California. We use the highest quality hardware and curved buckles for the most comfortable fit. Our line has expanded from Dog collars and leashes, to cat collars and harnesses. GwenGear provides Modern style for the hippest customers. 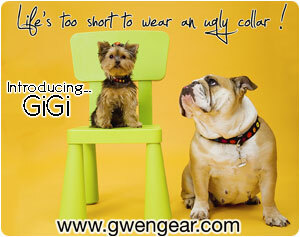 All sizes can wear GwenGear, from XS to XL we have a collar to fit your dog. Our motto: "Life’s too short to wear an ugly collar!"